The End is near… for the Wheel of Time! I have been following this book series since middle school (which is a damned long time for those of you keeping track) but now the end is nigh. 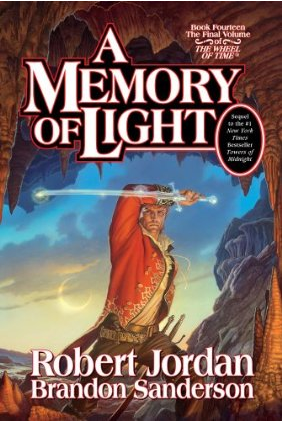 I, along with millions of other fans, have lived through years of waiting for book releases, the heartbreak at losing the original author to amyloidosis, and the relief at having the series finished by the capable hands of Brandon Sanderson. But soon I will have not just an ending, but the ending – penned by Robert Jordan himself before he passed away. I am on my way to the bookstore now, and, after the agonizingly long drive home from there (yes, it will be hard not to just sit and read it in the parking lot), I plan to disappear from the world until it is finished. Because spoilers are NOT acceptable. My apologies if blog posts continue to remain scarce for a while. Hmmmm….. I just started reading Brandon Sanderson (Mistborn series, Alloy of Law) but wasn't too sure about a series started by one author and finished by another. From the sound of your comments my fears are unfounded. And now the series is DONE, there's another plus. True – it is not THE ending. But it is *an* ending. And it is the right ending. Yes… I don't think it is ever ideal for a series to be finished by a different author. But if it had to be, then Brandon Sanderson was the right choice. And the ending (the end of the last book) was mostly written by Robert Jordan himself. I think it had a fitting conclusion. Have fun with the Mistborn books – I love those too! Probably my favorites (so far) of Brandon Sanderson's novels.